September, Friday 2, 1864 Near LoveJoy Station Ga. The rebles evacuated Jones Boro last night and we folowed them up early this morning. we correll the enamy again at 2 oclock this P.M. our Division Burnt a train of cars & distroyed a lot of Rail Road at this point to day and man wounded in [our Reg.?] today. we pased through Jones Boro this morning [distroyed?] by our Shell. it has been a very [pretty?] little town but is [distroyed?] 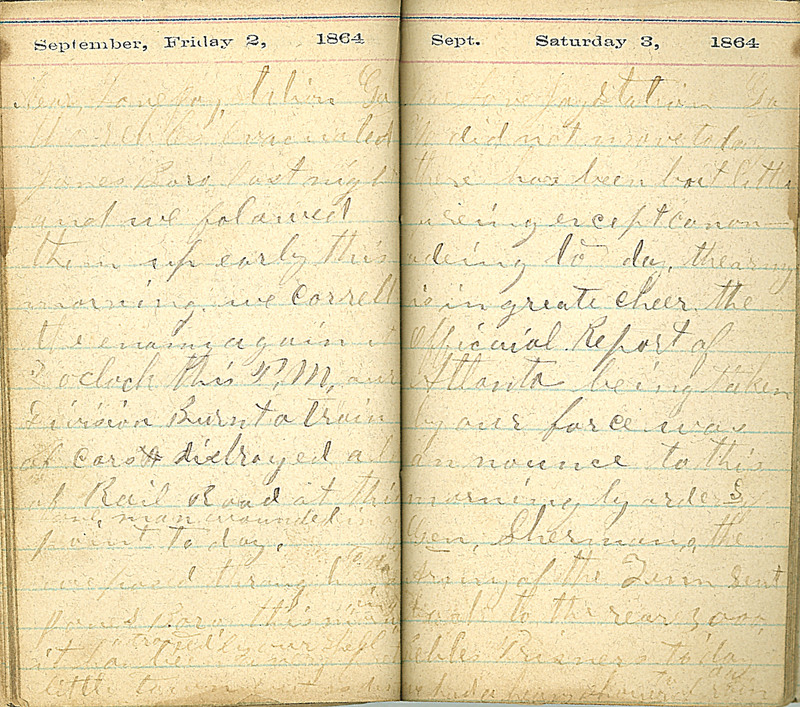 Sept. Saturday 3, 1864 Near LoveJoy Station Ga. We did not move today. there has been but little fireing except canonading to day. the army is in greate cheer. the Official Report of Atlanta being taken by our force was announce to this morning by orders of Gen. Sherman. the Army of the Tenn Sent back to the rear. 3000 Rebles Prisners to day. we had a heavy showers of rain to day.